I am hoping to upload one photo per day again, in an effort to get through my backlog of over 1400 unprocessed images from the past year. Here goes! 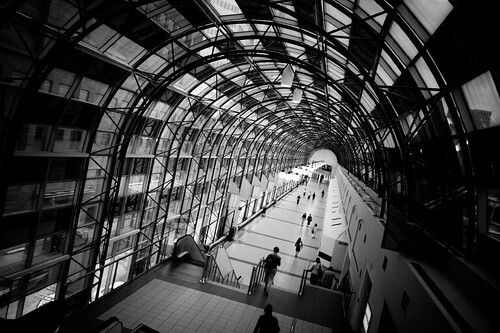 This photograph shows the Sky Walk which is the beginning of the PATH which connects most of Toronto's downtown core. I often walk through here when it is raining outside, as my apartment isn't far from the exit. I really like the design of this tunnel and I'm sure tourists find it a pleasant walk on the way to visit the CN Tower.